Absorbed dose rate to water at 0.2 cm and 1 cm due to a point isotropic photon source as a function of photon energy is calculated using the EDKnrc user-code of the EGSnrc Monte Carlo system. This code system utilized widely used XCOM photon cross-section dataset for the calculation of absorbed dose to water. Using the above dose rates, dose rate constants are calculated. 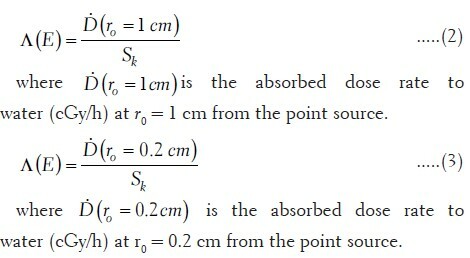 Air-kerma strength S k needed for deriving dose rate constant is based on the mass-energy absorption coefficient compilations of Hubbell and Seltzer published in the year 1995. A comparison of absorbed dose rates in water at the above distances to the published values reflects the differences in photon cross-section dataset in the low-energy region (difference is up to 2% in dose rate values at 1 cm in the energy range 30-50 keV and up to 4% at 0.2 cm at 30 keV). A maximum difference of about 8% is observed in the dose rate value at 0.2 cm at 1.75 MeV when compared to the published value. S k calculations based on the compilation of Hubbell and Seltzer show a difference of up to 2.5% in the low-energy region (20-50 keV) when compared to the published values. The deviations observed in the values of dose rate and S k affect the values of dose rate constants up to 3%. Brachytherapy is one of the most popular modes of treatment due to its advantage of highly localized tumour dose delivery and at the same time sparing of normal tissues because of rapid dose fall off at various distances from the source. Dose rate constant Λ is one of the key parameters of the dose calculation protocol. , According to AAPM (American Association of Physicists in Medicine) Task Group (TG) 43 and TG43-U1, , the dose rate constant is defined as the dose rate to water at a distance of 1 cm on the transverse axis of a unit air-kerma strength source in a water phantom. This constant includes the effect of source geometry, the spatial distribution of radioactivity within the source, encapsulation and self-filtration within the source, and scattering in water surrounding the source. In case of intravascular brachytherapy, the distances of interest are much smaller than the conventional brachytherapy reference distance of 1 cm. According to AAPM TG-60,  the dose rate constant is defined as the dose rate at a reference distance of 2 mm in water from a source of unit air-kerma strength. Luxton and Gabor  calculated the absorbed dose rate to water as a function of distance from monoenergetic point photon sources in a unit density water phantom using the EGS4 Monte Carlo code system. In their work, air-kerma strength S k per unit photon from an isotropic point photon source is obtained as a function of energy using the mass-energy absorption coefficient of air published by Hubbell  in the year 1982. The revised data of mass-energy absorption coefficients were published by Hubbell and Seltzer  in the year 1995. Using the values of dose rate at 1 cm from the source in water phantom and S k, Luxton and Gabor  calculated Λ as a function of photon energy. Chen and Nath  investigated the general properties of Λ and developed a simple analytical tool to calculate Λ. Selvam et al. published the values of Λ from a point monoenergetic photon source as a function of photon energy (20 keV-1 MeV). The authors used Monte Carlo-based MCNP code (version 3.1)  which is not capable of transporting secondary electrons produced by the photons. DeMarco et al.,  in their Monte Carlo study using the MCNP4C code,  emphasized that the photon cross-section dataset has to be updated to a modern tabulation such as DLC-146 or XCOM while simulating photons in the energy range 20-100 keV in materials of low atomic number such as water. Because, differences of up to 10% are observed in the photoelectric cross section for water at 30 keV between the standard MCNP cross-section dataset (DLC-200) and the most recent XCOM or NIST (National Institute of Standards and Technology) tabulation. According to TG-43U1 , formalism, S k is defined as air-kerma rate at the point along the transverse axis of the source in free space. In this study, the general formula proposed by Luxton and Gabor  is used to calculate S k (μGy m 2 /h) as a function of energy E (keV) for a point source of activity A (MBq). coefficient (m 2 /kg) of air and C = 0.5768 μGy kg/h/keV/MBq. The point source is in vacuum, and therefore, exponential attenuation and scattering by air is not required. In the present study, point photon source is positioned at the center of the water sphere of diameter 1 m for energy below 500 keV and 1.3 m for energy of 500 keV and above. The dimensions of the water phantom considered are consistent with the approach adopted by Luxton and Gabor. The absorbed dose rate per photon is scored in spherical shell of water of thickness 0.1 mm centered at distances of 0.2 cm and 1 cm from the point source. Density of water is taken as 0.998 g/cm 3 . The Monte Carlo-based user-code EDKnrc of the EGSnrc  code system is used for this purpose. The PEGS4 dataset needed for Monte Carlo calculations described above is based on XCOM  compilations. We set AE = 0.512 MeV (1 keV kinetic energy) and AP = 0.001 MeV while generating the PEGS4 dataset, where the parameters AE and AP are the low-energy thresholds for the production of knock-on electrons and secondary bremsstrahlung photons, respectively. All the calculations utilized the PRESTA-II step length and EXACT boundary crossing algorithms. In all calculations, electron range rejection technique is used to save computation time. We set ESAVE = 2 MeV for this purpose. The photon transport cut-off energy, PCUT, is chosen at 1 keV in all calculations. In EDKnrc calculations, we set AE = ECUT = 0.512 MeV (1 keV kinetic energy). We included bound Compton scattering and Rayleigh scattering in the calculations. Up to 10 8 photon histories are simulated. Depending upon the photon energy, the 1ó statistical uncertainties on the calculated EDKnrc-based dose values are generally in the range 0.1-0.4%. Using the absorbed dose rate values at 1 cm and 0.2 cm from the point sources, dose rate constants at these distances are calculated as a function of photon energy E as below. [Table 1] compares the values of absorbed dose rate to water per disintegration at 1 cm from the source times square of the distance from the source (nGy cm 2 /h/Bq) calculated using the EDKnrc and those published by Luxton and Gabor. The comparison shows that the values calculated in the present study are higher by about 2% than the published values in the energy range 30-50 keV. This difference is due to the most recent XCOM/NIST cross-section dataset used in the EDKnrc-based calculations. In the rest of energy region, the agreement is within 0.5%. 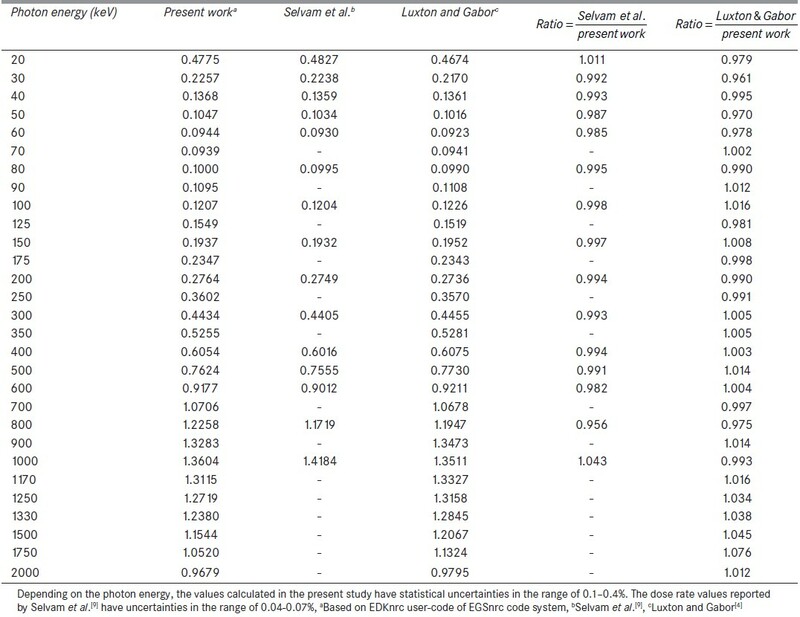 [Table 2] compares the values of absorbed dose rate to water per disintegration at 0.2 cm from the source times square of the distance from the source (nGy cm 2 /h/Bq) calculated using the EDKnrc and those published by Luxton and Gabor  and Selvam et al. The comparison (see column 5) against the values published by Selvam et al. shows about 4% difference at high energies (800 and 1000 keV). This is due to the fact that MCNP (version 3.1)  calculations did not include detailed electron transport and, therefore, collision kerma was approximated to the absorbed dose. Auxiliary simulations by setting ECUT = 2 MeV in the EDKnrc user-code produced comparable dose rate values at photon energies E = 600, 800, and 1000 keV against the values reported by Selvam et al. Note that calculation using ECUT = 2 MeV in the EDKnrc user-code is equivalent to scoring water-kerma, as the secondary electrons will deposit their energy where they are generated. 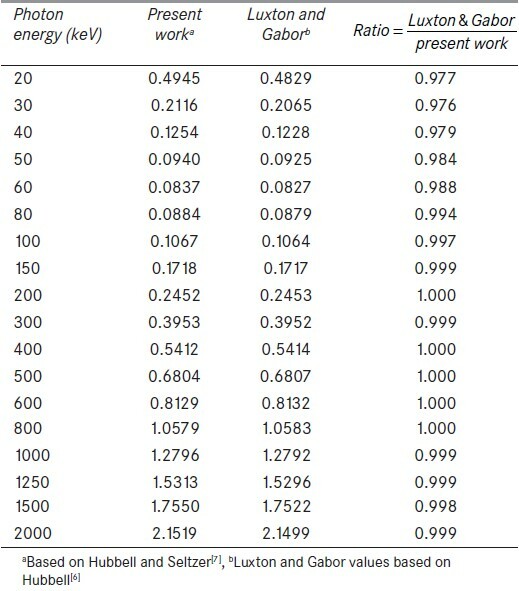 The last column of [Table 2] shows the comparison of dose rate values calculated in the present study and those by Luxton and Gabor. The differences are significant at both low-energy and high-energy regions. In the low-energy region, the difference is up to 4% (at 30 keV). In the high-energy region, the difference is between 2% and 8% (8% at 1750 keV). At 2 MeV, the comparison is within about 1%. [Table 3] compares the values of S k calculated in the present study against the values published by Luxton and Gabor. In lower energy range (up to 60 keV), the variation in the S k is about 2%. This difference is because the calculation of S k by Luxton and Gabor  was based on mass-energy absorption coefficient of air published by Hubbell  in 1982, whereas the present study utilized the mass-energy absorption coefficient of air published by Hubbell and Seltzer  in 1995. Note that the differences in the values of absorbed dose to water and S k as discussed above will directly affect the value of Λ. 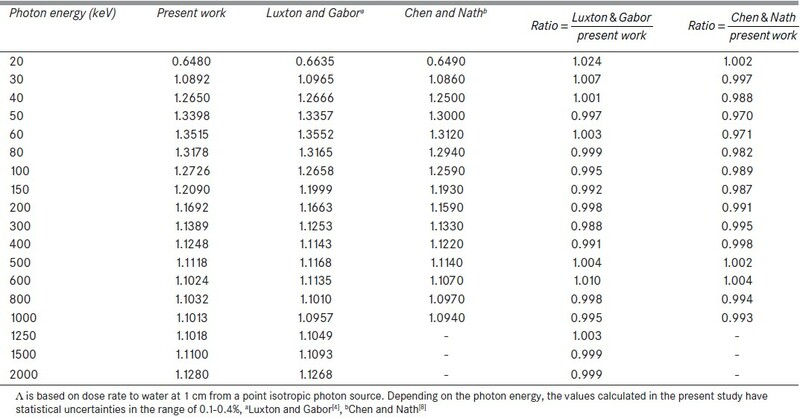 [Table 4] compares the values of Λ in the present work against the values published by Luxton and Gabor  and Chen and Nath. Λ is based on dose rate to water at 1 cm from a point isotropic photon source. The values reported by Luxton and Gabor  show agreement at all energies except at 20 keV where the overestimation is 2.4%. This is because the dose rate values at 1 cm and S k obtained in the present study are higher by 2% in the energy range 30-50 keV when compared to the corresponding values reported by Luxton and Gabor. Hence, there is no variation in the Λ values. 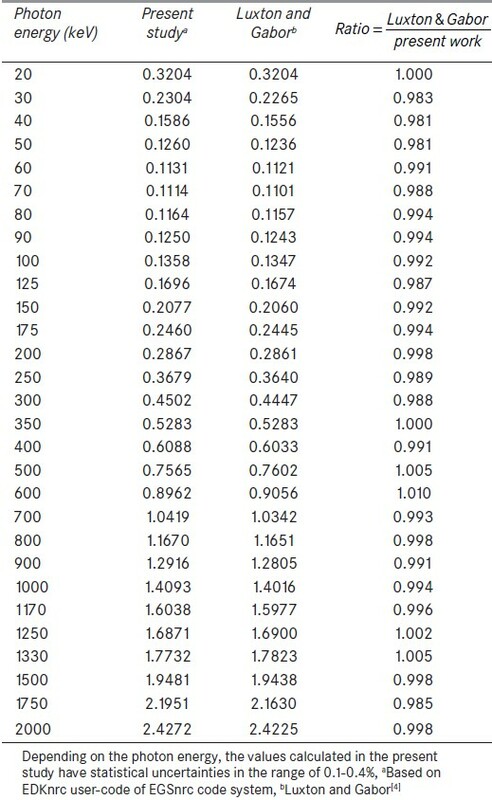 Whereas at 20 keV, the dose rates at 1 cm compare well [Table 1], and hence, a difference of about 2% in the Λ value is observed. The analytical calculation of Λ by Chen and Nath  utilized the Monte Carlo-based energy absorption buildup factors reported by Angeloupos et al. These buildup factors may not be accurate in the low-energy region as the calculations were based on old cross-section dataset. Hence, the values of Λ calculated in the present study are higher in the lower energy region (higher by about 3% at 50 and 60 keV). EDKnrc-based calculations show that dose rate values in water at 1 cm from the point photon sources are higher by about 2% than the published values in the energy range 30-50 keV. This difference is attributed to the most recent XCOM/NIST cross-section dataset used in the EDKnrc calculations. Regarding dose rate values at 0.2 cm from the source, the differences are significant at both low-energy and high-energy regions when compared to the published values. In the low-energy region, the difference is up to 4% (at 30 keV) and at 1.75 MeV, the difference is about 8%. The study suggests that the recent compilation of mass-energy absorption coefficient of air by Hubbell and Seltzer  is important for air-kerma strength calculations, as a difference of up to 2.5% is observed in the low-energy photons (20-50 keV). The deviations observed in the values of dose rate and air-kerma strength affect dose rate constants up to 3%. 1. Rivard MJ, Coursey BM, DeWerd LA, Hanson WF, Huq MS, Ibbott GS, et al. Update of AAPM Task Group No. 43 Report: A revised AAPM protocol for brachytherapy dose. Med Phys 2004;31:633-74. 2. Nath R, Anderson LL, Luxton G, Weaver KA, Williamson JF, Meigooni AS. Dosimetry of interstitial brachytherapy sources: Recommendations of the AAPM Radiation Therapy Committee Task Group No. 43. American Association of Physicists in Medicine. Med Phys 1995;22:209-34. 3. Nath R, Amols H, Coffey C, Duggan D, Jani S, Li Z, et al. Intravascular brachytherapy physics: Report of AAPM Radiation Therapy Committee Task Group No. 60. Med Phys 1999;26:119-52. 4. Luxton G, Jozsef G. Radial dose distribution, dose to water and dose rate constant for monoenergetic photon point sources from 10 keV to 2 MeV: EGS4 Monte Carlo model calculation. Med Phys 1999;26:2531-8. 5. Nelson WR, Rogers DW. Structure and operation of the EGS4 code system. Monte Carlo Transport of Electrons and Photons, edited by Jenkins TM, Nelson WR and Rindi A. (Plenum, New York) 1988. 6. Hubbell JH. Photon mass attenuation and energy-absorption coefficients from 1 keV to 20 MeV. Int J Appl Radiat Isot 1982;33:1269-90. 7. Hubbell JH, Seltzer SM. Tables of X-ray Mass Attenuation Coefficients and Mass Energy-Absorption Coefficients 1 keV to 20 MeV for Elements Z=1 to 92 and 48 Additional substances of Dosimetric Interest, Technical Report NISTIR 5632, NIST, Gaithersburg, MD 20899, 1995. 8. Chen Z, Nath R. Dose rate constant and energy spectrum of interstitial brachytherapy sources Med Phys 2001;28:86-98. 9. Selvam TP, Nagarajan PS, Rajan KN, Sethulakshmi P, Bhatt BC. A semi-analytic approach to determine dose rate constant of brachytherapy sources in compliance with AAPM TG 60 formalism. Australas Phys Eng Sci Med 2003;26:78-83. 10. Briesmeister, JF. MCNP - A general Monte Carlo N-particle transport code (version 3.1) Los Alamos, United States: Los Alamos National Laboratory; 1983. 11. DeMarco JJ, Wallace RE, Boedeker K. An analysis of MCNP cross-sections and tally methods for low-energy photon emitters. Phys Med Biol 2002;47:1321-32. 12. Briesmeister JF, editor. MCNP TM -A general Monte Carlo N-particle transport code Version 4C Report. LA-13709-M. Los Alamos, United States: Los Alamos National Laboratory; 2000. 16. Angelopoulos A, Perris A, Sakellarious K, Sakelliou L, Sarigiannis K, Zarris G. Accurate Monte Carlo calculations of the combined attenuation and build up factors, for energies (20-1500 keV) and distances (0-10 cm) relevant in brachytherapy. Phys Med Biol 1991;36:763-78.